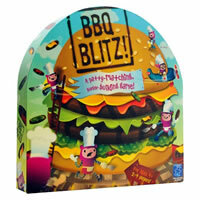 Designed as a fun game for younger kids, BBQ Blitz lets the kids do the cooking outside as they try to make matching burgers. This fun and adorably themed game includes spatulas, plates and all the food you'd need for a great cookout. Winning multiple awards, BBQ Blitz will light up the eyes of your little ones as they have a good time playing and cooking together. If you need a little help getting started or have a question about the very simple game rules involved with BBQ Blitz, we have you covered as we offer the official game rules below. Give BBQ Blitz a try today. Be the first to fill your plate with matching burgers and buns on top and you'll win. Inside the box you'll see a game board, 16 burger patties, 12 buns, 4 spatulas, 4 plates and the official BBQ Blitz game rules and instructions. Please keep in mind that the official BBQ Blitz childrens rules and instructions could be different depending on the game version you have. The rules below are some of the exact directions on how to play BBQ Blitz. Share with us your comments, funny stories, tips, advice, strategies, creative ways to play, questions about how to play, problems with the rules or anything you want about BBQ Blitz. All submissions will be reviewed within 24 hours. Click here to add your BBQ Blitz comments.